My favorite of all the pictures. Jill did an amazing job as the photographer to catch the moment! Jill and I enjoyed the bird park so much that we ended up taking a lot more pictures than we thought we would. So, in hopes that my dear readers enjoy birds, and photography, as much as we do, I wrote a second blog post with more pictures. These are mostly of the enclosed area where the lorries hang out and we were able to pay 2RM (about 70 US cents) to feed them and have them land us. It was a bit scary at first to have all these birds flying straight at us but after a few seconds, it was just fun and exciting. Jill was pretty nervous about the birds landing on her and I asked her to try it and just see how it would go (I did it first so she could see it wouldn’t be painful or dangerous) and she loved it. Something I truly love about Jill is that she is willing to take on things that cause her fear and anxiety and do, as we call it in behavioral therapy, “Exposure therapy” where one exposes themselves to the fearful, or anxiety causing, event and then realizes, very quickly, that the anxiety was just a lie and they can master it. Jill is incredibly courageous and has yet to turn down an exposure therapy when we travel. Again, I make sure to do whatever she is afraid of first, and I make sure to do things that terrify me so that I can get over my fears and anxieties since they are not based in evidence or reality. Swimming with sharks on this trip is a perfectly example of that. So was skydiving a few years ago. For almost all of us, we are amazing safe and protected. We just interpret things incorrectly and get anxious instead of working through them and becoming stronger as we master the event. 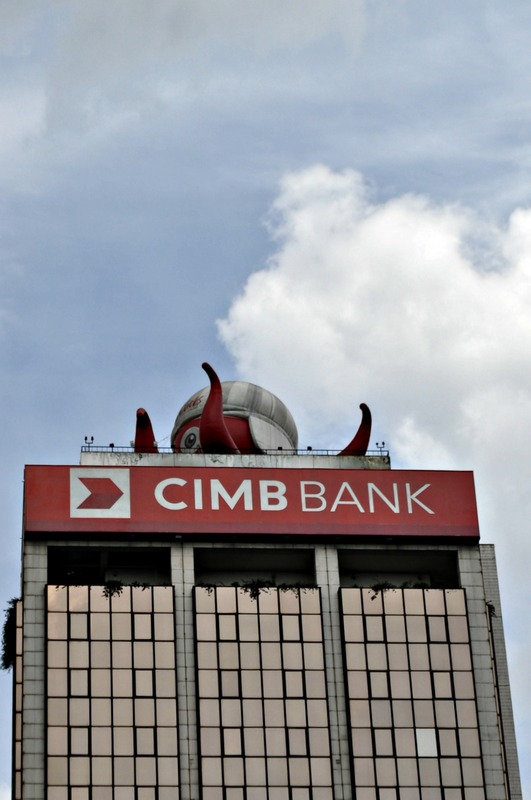 And a day after Chinese New Year, my blog heads back to Kuala Lumpur. 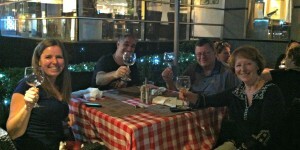 Jill and went on a Hop On Hop Off bus tour in Kuala Lumpur and had a great time. Kuala Lumpur, even though it has around 13 million people living in it, is a rather “small” city. It is easy to get to most tourist attractions by walking, or a very short taxi ride. However, whenever we travel to a new location, we like to take the hop on buses so we can get a good idea of where everything is located and sort of “ease” in to the new place without pressure of figuring everything out on our own. We hopped off the bus at the KL Bird Park and we instantly fell in love with it. The people there are quite friendly and everyone seemed to be having a great time. 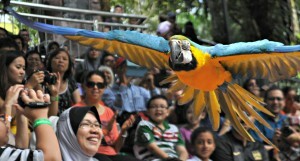 The birds, of course, were the main attraction and they were incredible. Our favorites were the peacocks that were strutting around the park and showing off to anyone that would look their way. 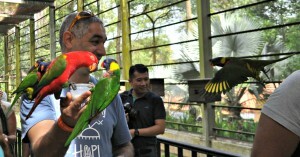 Another favorite was having the birds drink from our cups and sit on our hands, arms and heads. We stayed for the performance and enjoyed that greatly. 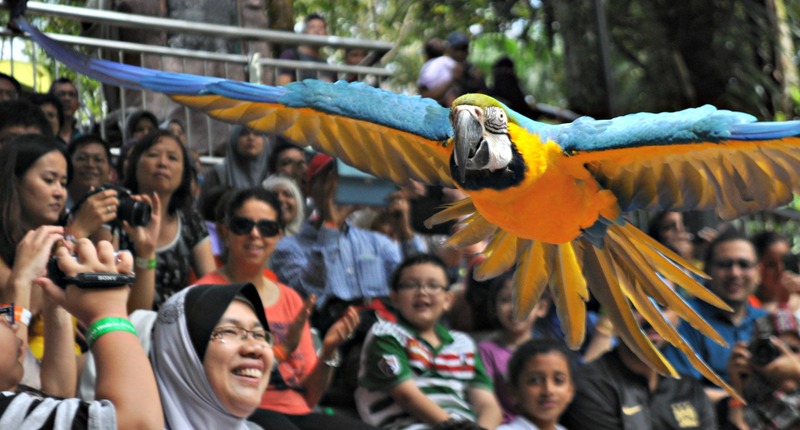 I was able to get a picture of a massive parrot flying right by us and sent it to the KL Bird Park who then published it on their Facebook page later that week. The world gets smaller and smaller the more we try to connect to each other. As I wrote on the Chinese New Year blog post, this is how expatriates make a family that spans the world and find ways to get the support they need when they are far from home. Day 224 in Beijing: Hairstyle Academy. Like Superman, I even have a cape! Jill and I were going snorkeling at Palau Payar and I needed a haircut. Why did I need a haircut to go snorkeling, you ask. Because I knew that when I got back to Beijing, I wasn’t going to have a chance to get a tan anytime soon and if I went snorkeling for a whole day down here, I’d get a wicked tan line around my head whenever I finally got my haircut. 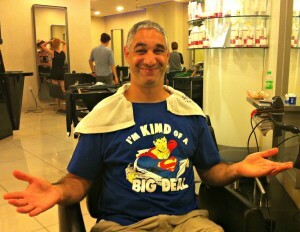 So, I decided to get my haircut in Penang. We walked around for a bit and noticed a sign for a hairstyle academy in the nearby mall. Academies usually have pretty inexpensive haircuts since the students are learning and it means you take a chance on them making a mistake. I’ve actually found they are incredibly professional and give the best haircuts around since they are being judged on them by their teachers. The hairstylist was friendly, funny, and very professional. She asked us questions about our trip and where we had been, planned to go and gave us a little information about herself and where she had come from and why she lived in Penang. She was born in northern Malaysia and had 3 siblings. She and another one lived in Penang but the other two stayed in up north. She told us there weren’t a lot of opportunities so she decided to move to the big city and she said she enjoyed living here now. She continued to work on my haircut, smiling and talking the whole time, and it was very enjoyable for both Jill and me. She also didn’t mind us taking pictures, which probably seemed a little insane to anyone that cuts hair for a living, until I explained that I write a blog and this will be a post on it. If you notice in the pictures, she actually uses a straight razor to do the final touches on my neck. It didn’t hurt at all and she took about 30 minutes total doing a fairly simple haircut and made sure I was happy the whole time. They also gave us free tea which was nice. By the way, after snorkeling, my tan line looks great and I won’t look like I’ve got some weird halo or something when I cut my hair next time thanks to her wonderful haircut! Day 221 in Beijing: Bathrooms and Prayer Rooms. 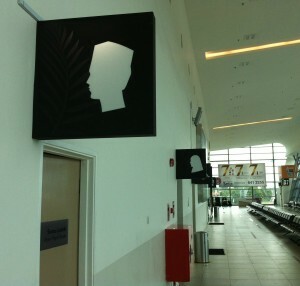 Two prayer rooms in the Penang Airport. There are many Buddhist, Hindu and Chinese temples all over Malaysia, but the Muslim religion plays a major role in day to day life. There are also the indigenous Malay religions and spiritual beliefs. That being said, Malaysia is, primarily, a Muslim country. Jill and I enjoyed hearing the call to prayer 5 times a day when we were waking up, walking around, or just sitting down to eat dinner. It is quite beautiful and it was interesting to see many men all start to go towards the mosques and get ready for prayer. We also took a lot of pictures at different mosques and did our best to not interfere with anyone that was praying since we didn’t want to be rude tourists. We found the people there to be incredibly kind, and helpful, and wanted to show us around the mosques and give us a little peak into their world. We flew home yesterday to Beijing. A quick aside, how strange is it that Jill and I call Beijing, “home” now? It seems natural and easy for us even though we aren’t really from the Chinese culture or society. We’ve blended in as well as we can in the 7 months we’ve been here and it feels fairly natural to write that as I sit here, looking out the window of my apartment, at the Roman statues in my complex. But Roman statues in a Chinese apartment complex is a story for another blog, this is about Malaysia and Muslims. We were walking to our gate and waiting to fly out when I noticed these bathrooms. It took me a second, even after being in Malaysia for 21 straight days, to realize that they were prayer rooms. Usually the prayer rooms have the word, “Surau” and a picture of a mosque on a sign next to them. This one didn’t, so I was a bit confused at first, but instead had a picture of a man with a taqiyah and a woman wearing the hijab. We saw a family walk up, separate according to gender roles, and go in to pray as we waited for our plane. The women were wearing black Burqas, and the men were wearing slacks and shirts. I have to say that Jill and I found the hijabs to be quite beautiful. Each woman seemed to choose colors and designs that would express who she is and allowed them to stand out in a crowd. Most of the hijabs that we saw in Malaysia are adorned with jewels and are very decorative. Jill had to wear them whenever we entered a mosque, and I had to wear them at a few of them, and we will post blogs about what it is like to be in a nylon hijab in 90 degree weather with 90 percent humidity. Simply stated, they were hot. I don’t think many women wear nylon hijabs in Malaysia and only the nylon hijabs are primarily used by tourists and need to be extremely durable. Day 220 in Beijing: Ego Pharmacy. Need some help with your ego? So, Jill and I were walking around Georgetown, Malaysia today looking for temples to visit. Trust me, that is not a hard job here as there are so many amazing temples from so many different cultures. We’ve found churches, mosques, Buddhist temples from Burma (the only Burmese Buddhist temple outside of Burma/Myanmar at this time), one from Thailand, and temples from China. We even found one a tower that combines Chinese, Thai and Burmese religions and houses a 90 foot tall Kuan Yin statue that is awe inspiring. However, since I work as a behavioral therapist, I noticed this sign and started laughing at it. I think, in many ways, that an “ego pharmacy” would be a wonderful addition to any practice. In fact, I think of myself as an ego pharmacist since I help people become more content and able to deal with stress in their life as my job. If someone is having a bad time, or overwhelmed or dealing with anxiety, among other things, I help them using empathy and then techniques and skills which are proven, scientifically, to relieve those issues and allow the person to figure out what is best for their life and what is their best choice at this time for them. People are constantly figuring out what is best for them and, therefore, behavioral therapy allows them to learn the skills that I know and be able to use them on their own to figure out what is right for them each and every day. It is a wonderful job since I get to see people grow, change, and decide out what is right for them every day. I don’t know of many jobs that offer that kind of reward and allow for such a positive change in the world. One of the beautiful parts of behavioral therapy is that my beliefs are not part of the issue for the client. They decide what is right for them and then figure out what choice they want to make and how they want to live their life. It will be their life and therefore it is up to them to take the responsibility and see what is right for them. Interestingly, when people decide they don’t want to change and then they realize that this is still a choice to stay the same, and therefore, by taking responsibility for “not changing” they have made a choice and a change. It becomes a paradoxical intervention that by not changing, you are changing, and that allows people to change more quickly. It is also solely based on their own choice so they feel more in control and empowered to make, or not make, the change that they feel is needed at that moment. So, if you want to change, or don’t and can’t figure out why it is so hard to be content, step on into the Ego Pharmacy and see what happens! Day 219 in Beijing: Lily’s Vegetarian Kitchen. Jill and I have decided it is time to start becoming more healthy and we’ve decided to try being vegetarian at this time. It actually started on New Year’s Day, even though it wasn’t a new year’s resolution, and it seems to have been quite easy so far. Strangely enough, we decided this before we went to a the Thekchen Choling Buddhist temple on New Year’s Day to hear the chanting that they perform for the new lunar month. But that is blog post for another day. 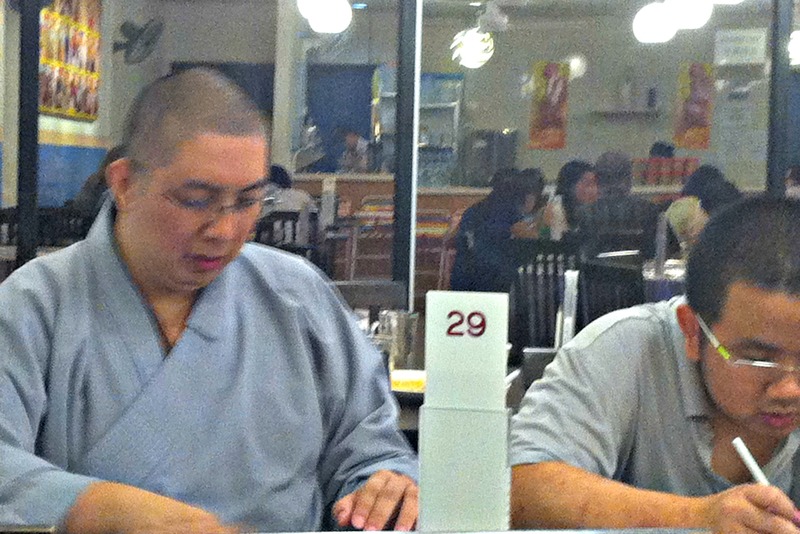 Being that Buddhists don’t eat any type of animal, and I then read the wonderful book, Direct Expressions written by their Lama Thubten Namdrol Dorje, and agreed with his viewpoints on health, treating other creatures with respect, and not wanting to hurt others, and therefore not wanting to hurt myself, and it just all fell into place. I’ve done stints of being a vegetarian for up to 6 months, and have found, when I set my mind to it, it is actually quite easy. One of the reasons is that I was in a pretty horrific car crash when I was 4 years old and have no sense of smell because of my head injury. I also believe that my sense of taste is probably at about 50% of what most people can experience. The silver lining is that I’m not tempted by smells of food as I walk by stores and restaurants, and therefore, find the ability to follow through on this change easier than most people since they are usually tempted and it is harder to ignore those senses. 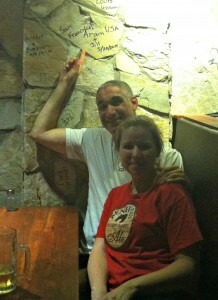 One of the restaurants we went to on our vacation to Malaysia was Lily’s Vegetarian Restaurant. It was only 2 blocks from our hotel, The Sunway Georgetown, and it was fantastic. We tried the local Penang style food, even though they had vegetarian fried chicken, which looked amazing, and were blown away. Everything was fresh, delicious, with just the right amount of spices. We also had soursop juice and lime juice for our drinks. Jill has become addicted to lime juice and I’ve become addicted to soursop. We have no idea how we will deal with the withdrawal symptoms when we return to Beijing in just a few days! All I can say is if we can find vegetarian food in Beijing that is at all similar to the food we’ve found here in Malaysia, we will not have a problem staying vegetarian and being much more healthy in the upcoming year. ps. If you’d like to read Direct Expressions, by Lama Thubten Namdrol Dorje, he has put it online in the form of a PDF. I highly recommend it as it is a wonderful read and he has a fantastic sense of humor and humility. Day 212 in Beijing: Truth in Advertising. 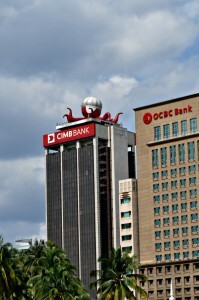 The Octopus is taking over this bank! I saw these two banks when I was in Kuala Lumpur and had to laugh at their names and mascots. 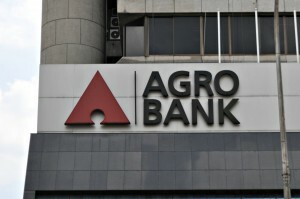 In Malaysia, “Agro” means “agricultural” so an “Agro Bank” is an agricultural bank. 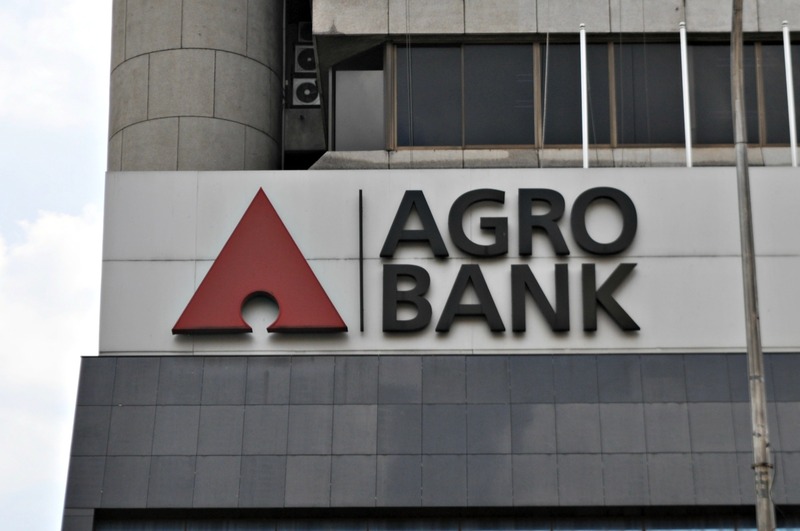 However, Agro also means aggressive so naming a bank, “Agro Bank” could be confused especially when you look at all the construction and aggressive lending that is going on in this country. Side view of the Octopus. 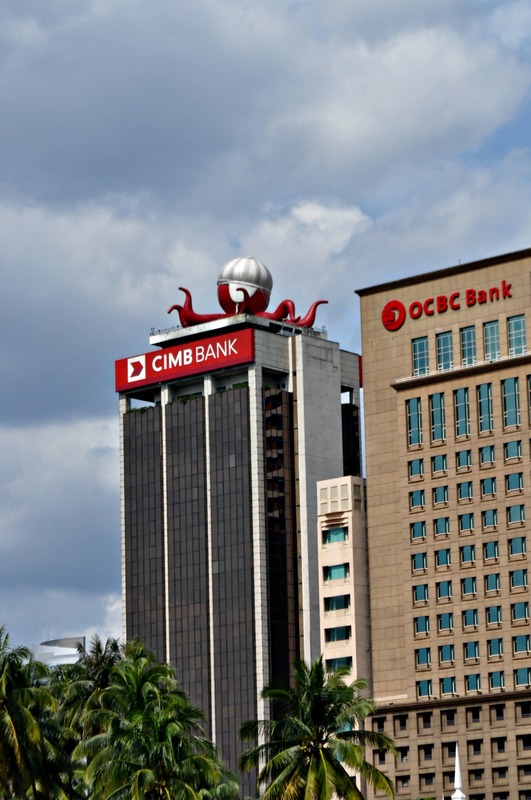 The second one is even more comical to me because I’m not sure an octopus is really a cuddly creature, to most people, that one would want representing their banking ideals. To me, an octopus reminds me of the evil Ursula in The Little Mermaid. Maybe in Malaysia there is a different interpretation, and I’m actually a fan of octopuses they are pretty cool creatures. By the way, the plural of octopuses is octopuses and not octopi, as I found out writing this blog post. 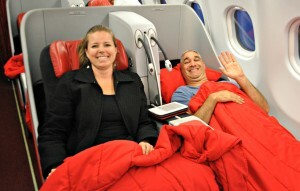 One never knows what one will learn when one travels or writes a blog. Either way, I enjoy how different cultures view the world and how they use icons and words differently than they do in the USA. It allows me to see that my view of the world is constantly being challenged and I get to learn that my view of reality, and life, is limited and open to interpretation. I’m gonna go agro all over you if I have to wait in line one second more! I appreciate this because I can continue to grow and learn about others, and myself, each day that I wake up. At age 44, I believe this is a pretty rare occasion as many people are married, have kids, mortgages, debt, and other issues that keep them from being able to take a new job and move half way around the world on a moment’s notice. I consider myself very lucky and do not take this gift for granted.